Note: This post first appeared on October 25, 2011. 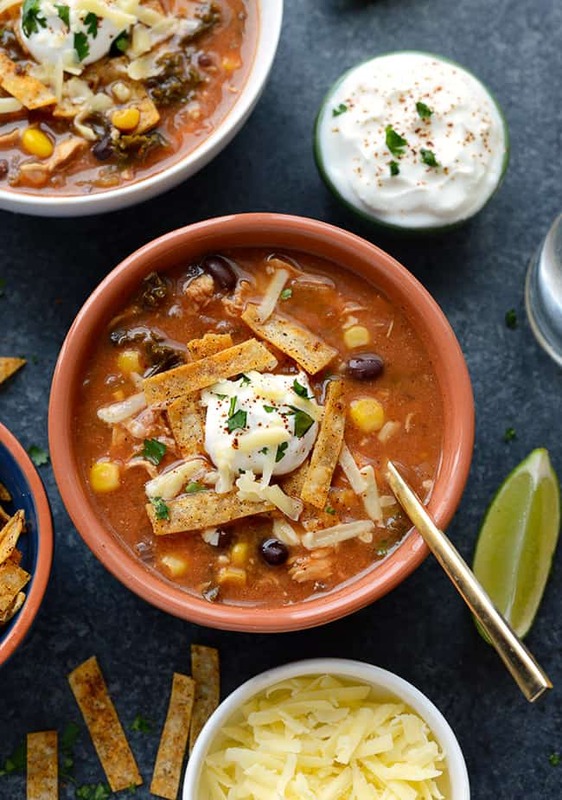 The recipe has been slightly edited, photography updated (thank goodness because it was pretty horrific before) and now includes 5 other healthy soups perfect for fall from some of my blogging friends. Enjoy! 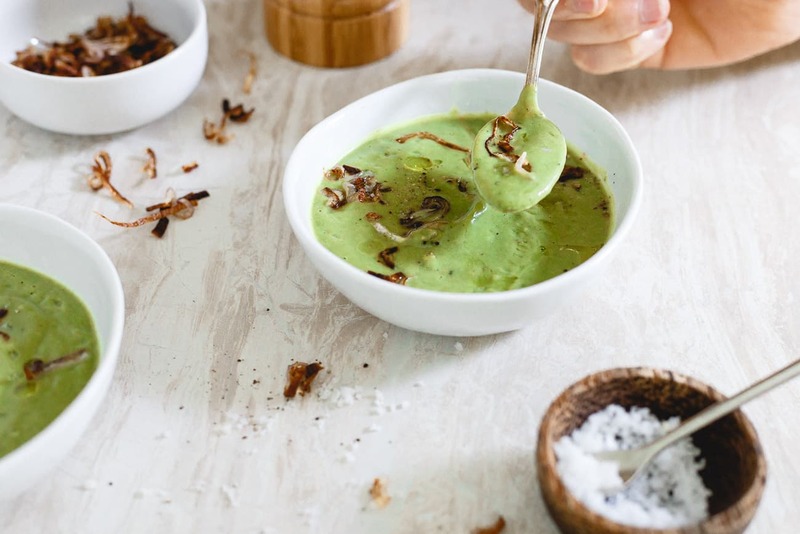 This easy creamy broccoli soup is rich, comforting and topped with crispy shallots. It’s also paleo, gluten free, vegetarian and vegan. The text in the original post (which I’ve deleted) talked all about how much broccoli we eat in our house. 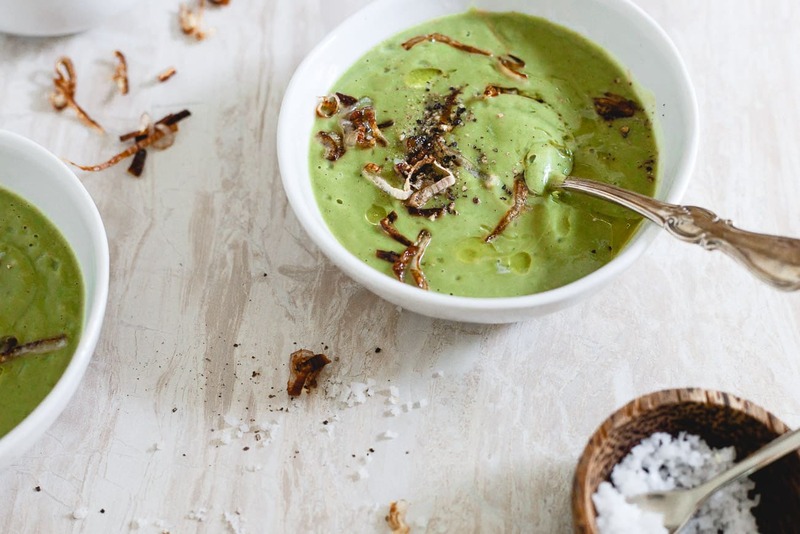 A lot has changed in the last 5 years since I first posted this creamy broccoli soup but, our broccoli consumption is not one of them. You can find a huge bag of organic florets (awesome score at BJs) constantly in our freezer as back up but to be honest, it hardly gets used because there are pretty much always, at minimum, at least 2 heads of the vegetable in our refrigerator as well. I seriously have never understood that kid aversion to this magnificent vegetable because I love it so much. 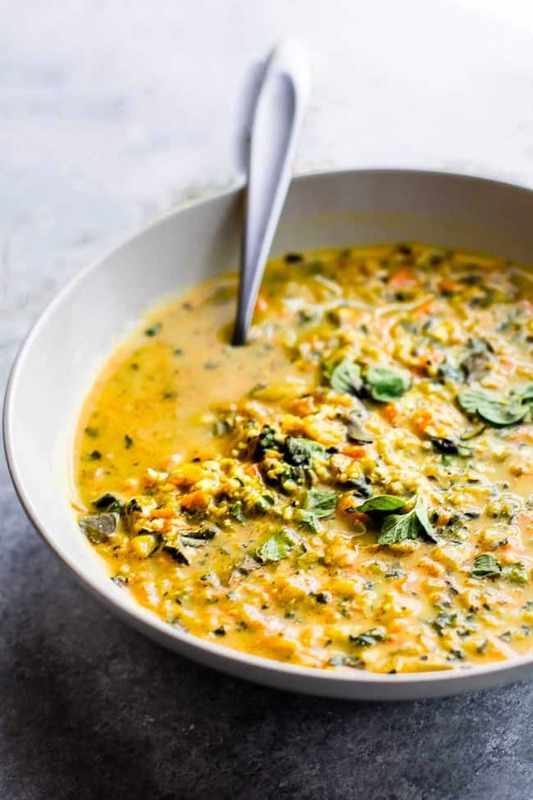 And while I’m happy to eat it every way from a simple steam with a squeeze of lemon to roasted to even riced, sometimes I go all out and make this creamy broccoli soup. It’s been a long time favorite because it’s just seriously so easy and the best part is the ingredient list. It’s healthy AF, guys. But before we get into this soup, let’s take a look at what everyone else brought to the table! They’re all so cozy and perfect for fall, aren’t they? The way this creamy broccoli soup is written in the directions, it’s paleo. That said, of course you can use regular flour and milk if you’d like and it’d still be an amazingly delicious healthy bowl (and still vegetarian and gluten free). The crispy shallot topping is something you don’t want to skip. 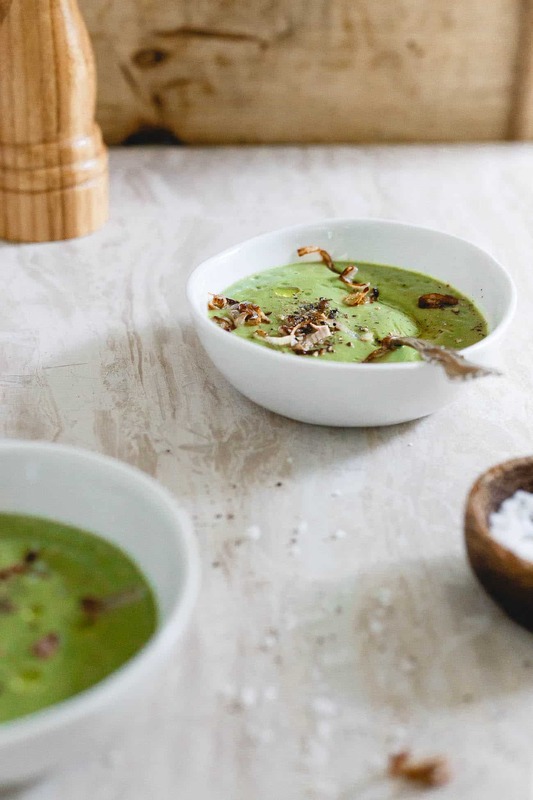 It brings a bit of texture to the otherwise completely creamy soup and a pop of flavor both from the sweetness of the shallots and the olive oil they’re crisped in. This one will be on rotation all season long along with Italian tomato pasta soup and cinnamon ginger kabocha squash soup. Think I’ll be covered on the comforting soup front with those three! 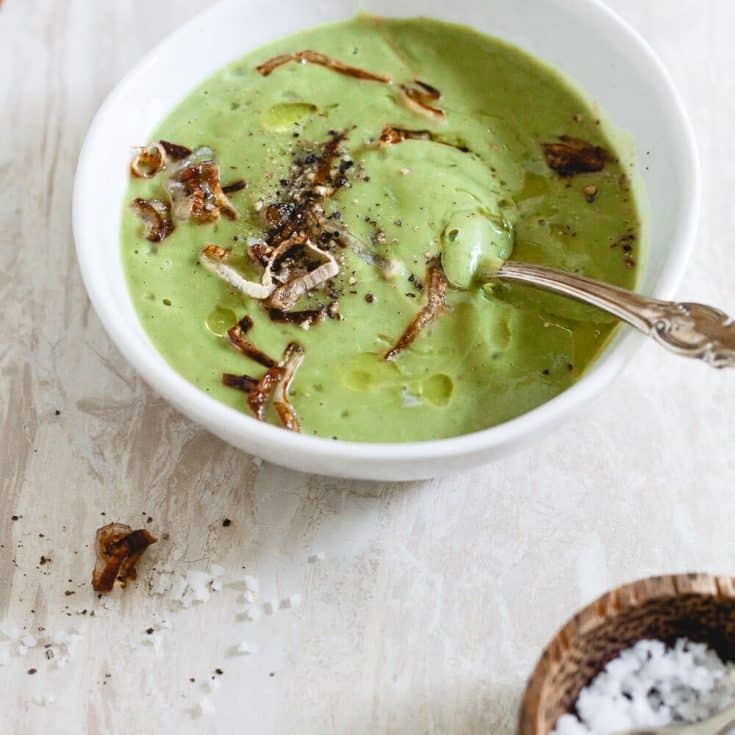 This easy paleo creamy broccoli soup is rich, comforting and topped with crispy shallots. It's also gluten free, vegetarian and vegan! Add broccoli, cumin, thyme, nutmeg, salt and pepper and cook covered under low-medium heat for about 35-40 minutes until broccoli is soft. Heat olive oil in small pan, add shallots and cook for 3-5 minutes over medium-high heat until golden brown and crispy, careful not to burn. Remove shallots from the pan to a paper towel and let drain. 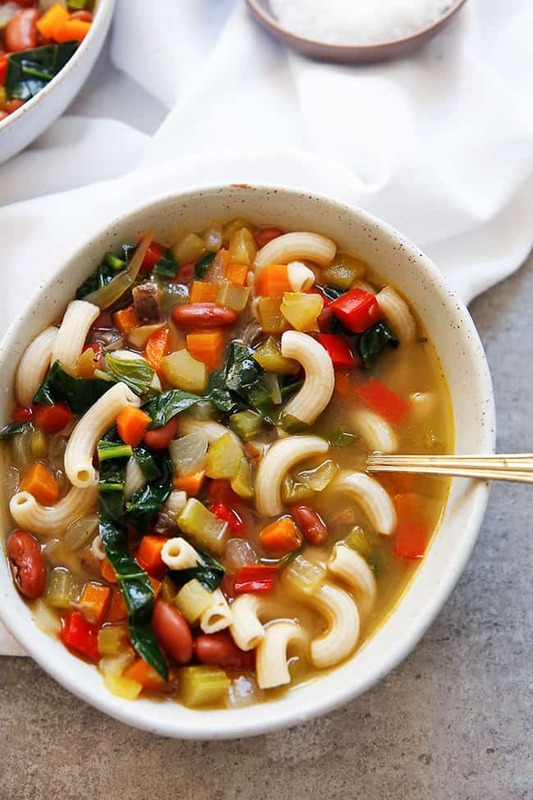 Fabulous soup! No scary appliances here, but I did splurge and buy a Vitamix after my other beloved blender broke this summer and I love it! Used to have a bad coffee maker….every now and then I would wake up to coffee all over the counter and floor. Now that was very scary! My favorite cream of soup is definitely broccoli, but after seeing that blender thing you have, I’m pretty sure I’m not going to attempt to make it on my own. this is my second favorite soup. I have never crispified shallots to put in it. I want to do that now. dear god I love everything about this. they totally make the soup, do it! Way to go Ulysses! I don’t have an immersion blender, but it seems they work well. Oh YUM, this looks incredible! So yummy. Plus, it looks like it could be served at a 5 star restaurant… so fancy in presentation. I must try it! I love, love, love broccoli! 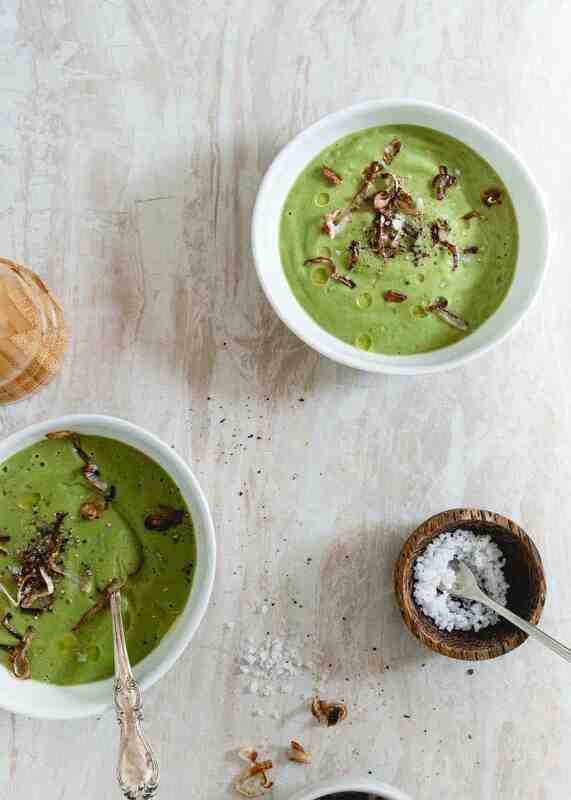 I’ve had cream of broccoli soup before, but this looks fantastic and not as heavy as the actual cream based stuff. My favorite “cream of” soup is probably mushroom. It’s great on its own but also in casseroles and to cook chicken with. I always wanted an immersion blender and finally got one earlier this year. I love making smoothies, milkshakes, and mixing batters with it. Everything gets so smooth and it’s so easy to clean afterwards. Looks so yummy. We got an immersion blender and have only used it twice, but am dying to try some soups. This could be one of them! I am obsessed with your dishes and napkins. Where do you get these gorgeous things? Also, how do you get your comments to be numbered?! Whenever we have broccoli for dinner, half of it’s gone from the pan before it even makes it to the table because we’re all such broccoli-fiends. 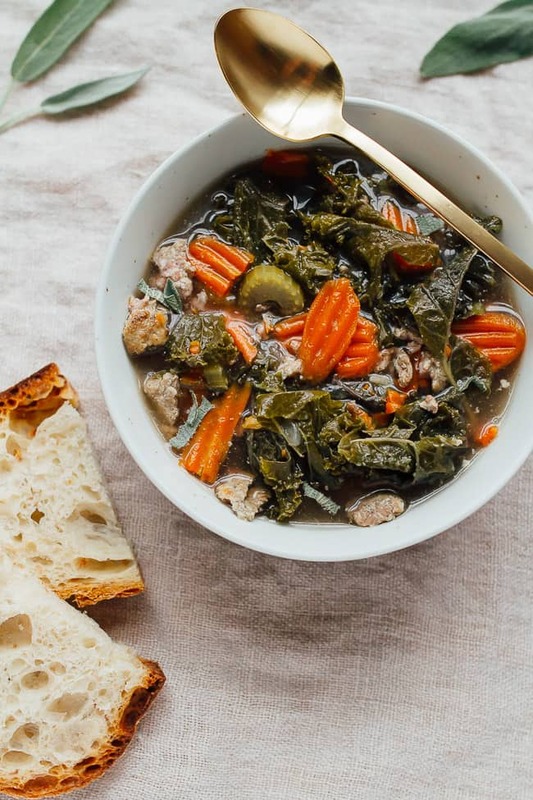 I’ve never even thought of making broccoli soup because we have such a set soup rotation, but this will definitely be making it’s way in there! WHOA! I have got to try this and hopefully it tastes as good as your photos look!! I have to do my grocery shopping tomorrow so I plan to pick up the ingredients I need and make it over the weekend. I’m sure my family will go nuts over this!! I was looking for some inspiration on what to make for dinner and I came across your website. Here are a couple of tips/tricks which may or may not be helpful! I, too, have a Vitamix (as a previous poster mentioned) and I love it. I typically don’t use cream or milk in my soups but will put in some boiled potato, or white beans to provide the “creamy” effect. You can’t get the same effect with the immersion blender (I have one of those too-and it is handy for certain things). Happy eating! So glad you decided to share this one again Gina! It looks delicious. The crispy shallots on top sound like the perfect addiction. I love the other recipes in the round up too, so thanks for sharing. 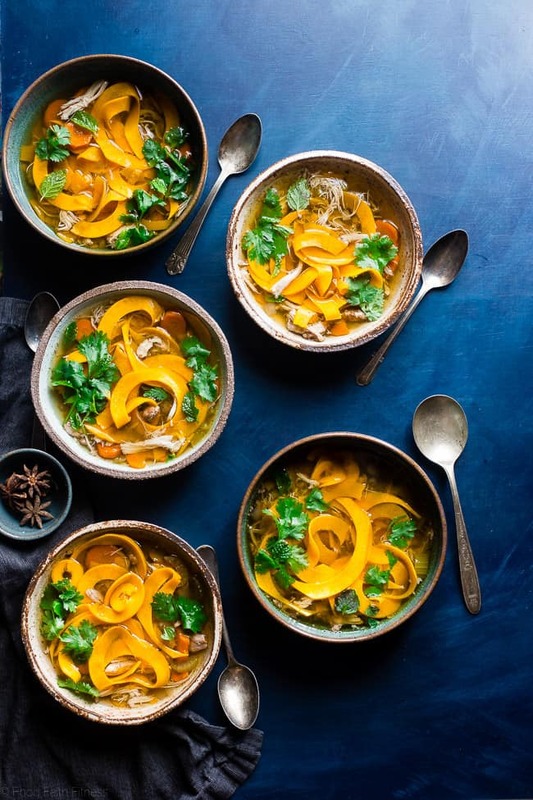 That’s one of the prettiest round ups of soups! I eat broccoli SOOOOO often! Clearly, I need to get on the broccoli soup train. And those crispy shallots? Heaven. Broccoli soup is probably my favorite soup to make and eat. Topping it with crispy shallots is just genius. Yum! It’s. I’ve and cool here today so this sounds so perfect! Oh yum. I love the looks of this (and the new photos are stunning)! And that crispy shallot topping… gimme! i could eat 10 bowls of this. THe crispy shallots is ON POINT friend! This looks delicious. I’m a huge broccoli fan, raw, roasted, whatever. I totally get you there. I cannot wait to make this. CRISPY SHALLOTS? Yes!!!! Made this last night and it was a huge hit!! Both my husband and I basically locked our bowls clean. Definitely adding this to my list of go-to recipes, thanks so much! Just made this tonight and had to come back here to say thank you! The seasonings are perfect. What a nice surprise, so delicious! I will crisp shallots next time since I didn’t have any. Glad you liked it! Definitely give the shallots a try next time, they’re my favorite part! I haven’t tried to be honest.